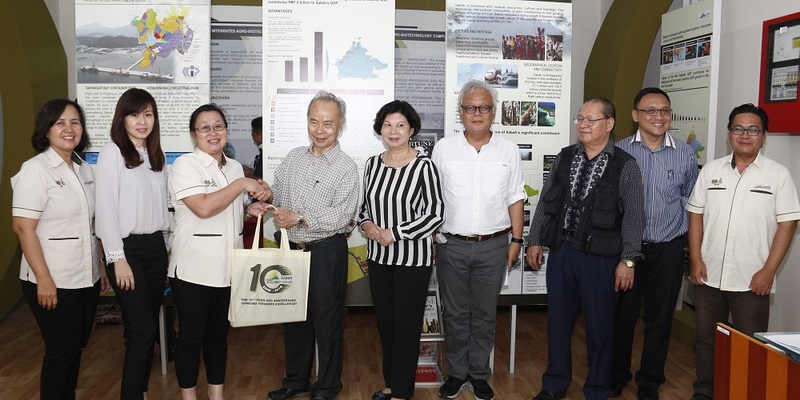 Kota Kinabalu (Thursday) - The Sabah Economic Development and Investment Authority (SEDIA) today welcomed a visiting delegation at the Sabah Agro-Industrial Precinct (SAIP) by the board of directors of the Institute of Development Studies, Sabah (IDS). The IDS delegation, led by their Chairman Tan Sri Simon Sipaun, was met by SEDIA Vice President Mary Sintoh and SEDIA staff based at SAIP. SEDIA was established on January 15, 2009, through the adoption of Sabah Economic Development and Investment Authority Enactment 2009. The Enactment was assented by the Tuan Yang Terutama Negeri Sabah on February 23, 2009, and gazetted on February 26, 2009. Through the enactment, SEDIA is vested with the necessary power to serve as a decision-making and execution institution that is tasked with realising the SDC vision and mission, by being the One-Stop Authority to plan, coordinate, promote and accelerate the development of the Sabah Development Corridor (SDC). SDC was launched on January 29, 2008 during the Ninth Malaysia Plan as one of Malaysia's five regional economic corridors, with the aim to accelerate the growth of Sabah's economy, promote regional balance and bridge the urban-rural divide, while ensuring sustainable management of state resources. IDS was established in 1985 to promote research-based decision-making in government with regard to policy formulation and implementation, serving as a think tank to the State government. SEDIA Chief Executive Datuk Dr. Mohd Yaakub Johari had previously served as IDS Executive Director/Chief Executive, during which time the institute was assigned as principal consultant to spearhead preparation of the SDC Blueprint. Upon its establishment, Datuk Dr. Yaakub and several IDS staff were seconded to SEDIA. Both SEDIA and IDS are currently based at Wisma SEDIA, and have collaborated in various capacities ranging from conducting research and feasibility studies, to organising seminars and study visits. The visit began with a tour of SAIP and the available facilities. With an estimated area of 185 acres, SAIP is envisaged as a centre of excellence in agro-biotechnology that optimises the state's biodiversity and abundant natural resources to produce higher value-added food and specialty products based on botanicals, aquatic plants and animals. By 2017, all of the physical construction works on phases one and two of SAIP project development, together with the procurement of various machinery and equipment, have been completed. These two phases of development consist of six facility infrastructure, housing the Administration and Incubation Centre, Research, Development, Commercialisation and Innovation Laboratory, Post-Harvest Collection and Handling centre, food processing Production Line Facility, Herb Manufacturing centre, and CEF greenhouses. The machinery and equipment at SAIP include over 45 laboratory equipment, specific for conducting plant tissue culture, horticulture research, product development, and food analysis. More than 90 types of machinery and equipment are also provided for agriculture and herb downstream processing. SAIP is also currently undergoing certification for Good Manufacturing Practices (GMP). Members of the delegation were also briefed on the Agro-SAIP training programme, which have thus far benefitted 2,021 participants from throughout Sabah over the span of 36 courses since its inception in 2012. The Agro-SAIP training programme, which assists local SMEs to enhance their skills, expertise and capabilities, was established with the aim to empower technopreneurs in the agro-based industry, by giving the necessary exposure and transfer of knowledge, especially on the processing of agro-food and specialty natural products (SNPs). Through the training programme, participants are given access to experienced speakers and industry representatives in various sectors; speakers well-versed in pharma-herbs, controlled environment farming, post-harvest handling technology, agro-organic and agro-food industries, business and marketing through e-commence, and bio-science and biotechnology had been invited to come and share their experience and expertise with participants. The introduction of SDC has no doubt created greater awareness on investment opportunities in Malaysia's second largest state. Unlike other development corridors in Malaysia, SDC - an 18-year economic development programme - covers the whole state of Sabah. The corridor initiative uses a holistic development approach to ensure economic development benefits everyone in the state. Subsequent to the launching of SDC, SEDIA has been promoting Sabah, under the SDC investment tagline, "A preferred destination for business, culture and nature". With the advantages that Sabah has to offer, SEDIA has managed to attract tremendous interest amongst local and foreign investors into Sabah. Since the commencement of the Second Phase of SDC in 2011, SEDIA has been aggressively promoting investment into SDC. SDC had entered into its Third Phase of implementation in 2016, and SEDIA has adopted a more focused and targeted approach in attracting quality investments in new growth areas, especially in service-based, innovation-led and knowledge-intensive industries including in Industry 4.0. During the Eleventh Malaysia Plan, SEDIA has been according greater emphasis on improving the state's economic competitiveness by enhancing the state's global connectivity to ensure seamless movement of people, goods and services. Efforts would be directed especially towards enhancing the efficiency of the logistics sector by improving the relevant infrastructure and the integration of land, sea, and air services. In the long run, this will help in reducing the cost of living and doing business. Measures implemented under SDC thus far have succeeded in drawing investments into Sabah that, by 2017, Sabah recorded annual GDP growth at 8.2 percent, the fastest in Malaysia, overtaking all the other states in Malaysia and surpassing the national average at 5.9 percent, as reported by the Department of Statistics (DOS).